What Happens When You Are At The Cup Cafe Tucson? The Cup Cafe is an institution in downtown Tucson, AZ. Walk into the Congress Street entrance of the Hotel, go pass the hotel desk and there it is on the left. Opposite the Hotel Congress Tap Room in the lobby is the Cup Cafe. The Cup Cafe is well know Tucson dining experience for locals and visitors. The Cup Cafe’s reputation for creative presentation and eclectic dishes is notable. It is full service dining in a modern, but historic Tucson landmark. After diner, indulge yourself with one of the fantastic deserts. All make in house. Indoor seating is a bit noise but part of the unique historical setting. The patio seating is comfortable and offers great people watching. The full service bar offers interesting cocktails, good wine and beer choices. If there is a wait to get in, one of the “build you own Bloody Mary bar” will help the time pass. The Hotel Congress is on Congress Street in downtown Tucson, Arizona. The Hotel and the Rialto Theatre, just across the street, date back to 1919. The Cup Cafe patio at Hotel Congress provides a view of the historic Amtrak station. The station was built by Southern Pacific in 1907. Without the events on January 22, 1934, the Hotel Congress would may never have been notable. 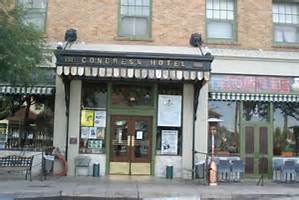 John Dillinger and his gang were laying low in Tucson at the Hotel Congress. The arrest of Dillinger and his gang near by the hotel made it famous. That event gave the Hotel Congress a distinctive place in Tucson, Arizona history. The Cup Café Hotel Congress opens at 7 AM seven days a week. It is a great spot for a weekend brunch, but expect a wait. The “Cup” is one of the best spots in downtown Tucson. And be sure to stop by the dessert case. The variety of items rotating behind glass will are outstanding. Oh, did I mention the calories? Just forget about it! If you visiting Tucson AZ, put The Cup Cafe on your list of place to eat. Whether it is breakfast, lunch or diner. So what happens when you are at the Cup Cafe Tucson? You will experience a unique step back in the history of Tucson Arizona. Enjoy some great food in the historic Hotel Congress. 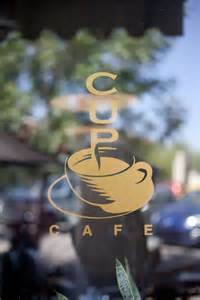 The Cup Cafe is one of the many outstanding dining experiences Tucson AZ has to offer. If your are considering a move to Tucson, AZ give us a call. Whether you are moving for a new job, a winter retreat or wonderful place to retire too. We are the professionals and know the Tucson and surrounding area real estate market.